The commentary that has arguably been the one of the most long-awaited is finally published and in print by Sheffield Phoenix Press. 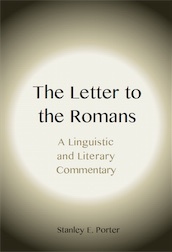 Our very own contributor to this blog, Stanley Porter, has written one of the most detailed commentaries on the letter to the Romans. He applies his knowledge and expertise in Greek linguistics to the text, utilizing a form of what he calls register discourse analysis, a type of discourse analysis utilizing the three semantic components of register (field, tenor, and mode) to analyze the text. One of the strengths of this commentary is this discourse analysis approach that is used alongside a rigorous Greek linguistic analysis that will complement the other commentaries on Romans out there. Click here for more information from the publisher’s website. This entry was posted in book reviews, publications and tagged commentary, discourse analysis, Greek linguistics, register analysis, Romans, Sheffield Phoenix Press. Bookmark the permalink. Is your new commentary something that would be readable by someone with no experience in Greek? Would it help a layman better understand Romans? Thanks for asking about my new commentary on Romans. That’s an excellent question. I have written what I call a register discourse analysis, and so am commenting upon a variety of features of the language (not just words), but in such a way as to avoid needing Greek. In fact, I use very little Greek apart from a few words here or there. So, I would very much like to think that it is readable by someone without Greek, and I think would be very understandable and beneficial for a layperson. I hope that you enjoy it and find it helpful. By the way, it is available directly from Sheffield Phoenix Press at a great price. Check their website (http://www.sheffieldphoenix.com/showbook.asp?bkid=324).